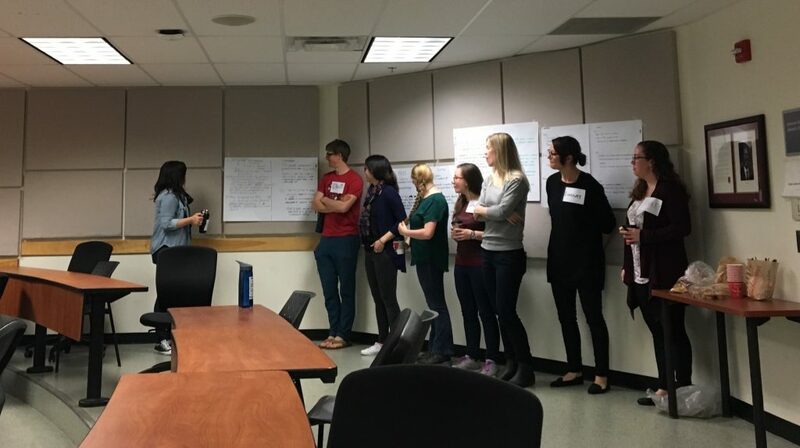 MAGNET’s 5th annual workshop took place in Kingston, Ontario from May 10-14, 2017, and brought together 19 trainees from across the network, including the University of British Columbia, the University of Toronto, the University of Ottawa, McGill University, and Université du Québec à Chicoutimi. The workshop was organized by the local organizing committee from the University of Toronto, and included a full schedule of field activities, lab tours, and professional development seminars. The group at QUBS after the first two days of field activities. 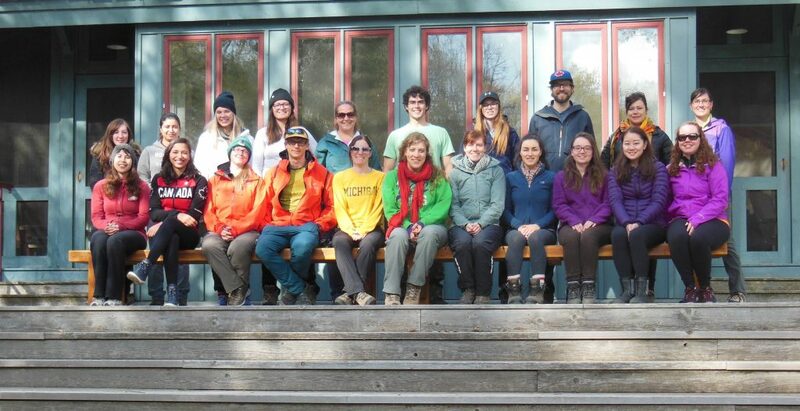 The first two days of the workshop were spent doing field activities at Queen’s University Biological Station (QUBS). 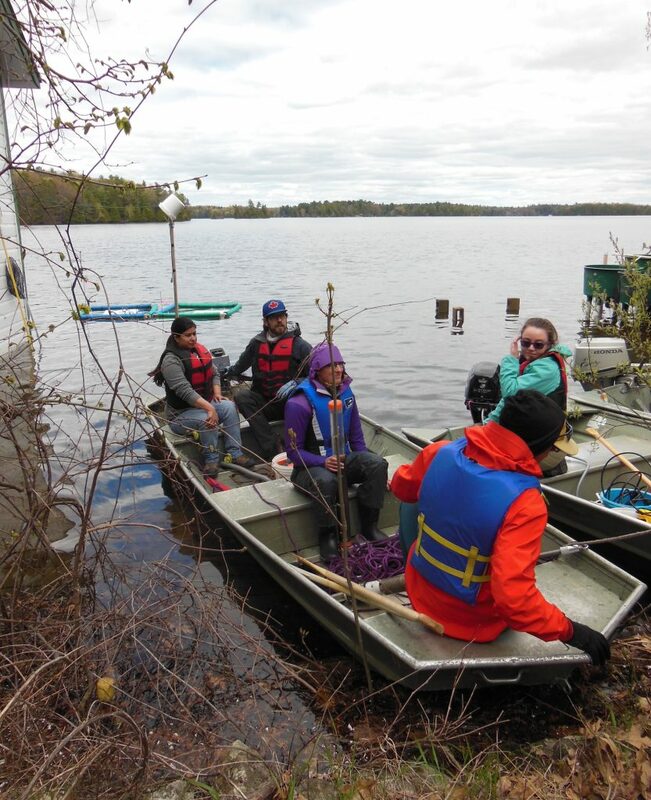 After a scenic and winding drive, the group arrived at the station, ready to begin collecting physical, chemical, and biological data to investigate and assess the ecological and environmental conditions of Lake Opinicon. Record rainfall, finicky boat engines, and the lake’s unexpected shallowness caused a few unforeseen challenges, but the group made do and persevered (and learned that we have a few expert boat-starters in our midst!). The first group heads out on Lake Opinicon. 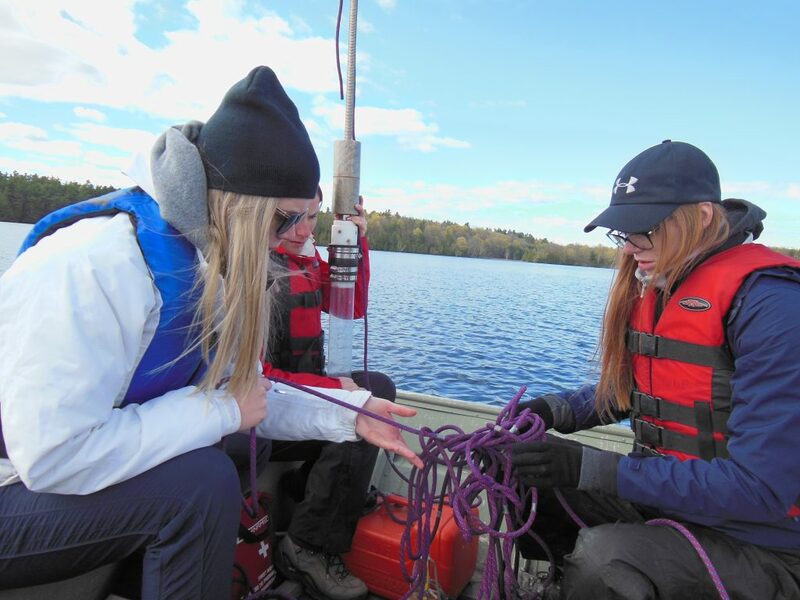 After an introduction to lake geochemistry by MAGNET Professor Bridget Bergquist, groups of trainees went out in boats to take lake sediment cores, and light and geochemical profiles. The trainees enjoyed using new equipment (percussion corers, YSI meters) and techniques that they had learned earlier in the day. Back on land, the group attempted to extrude the collected lake sediment cores, with mixed results. The first one failed (in a rather comical fashion), but the second one was successful. On Thursday, more lake sediment cores were obtained, and successfully extruded due to some great teamwork! In addition, a plankton tow was conducted, and trainees were able to identify the zooplankton collected in the sample. 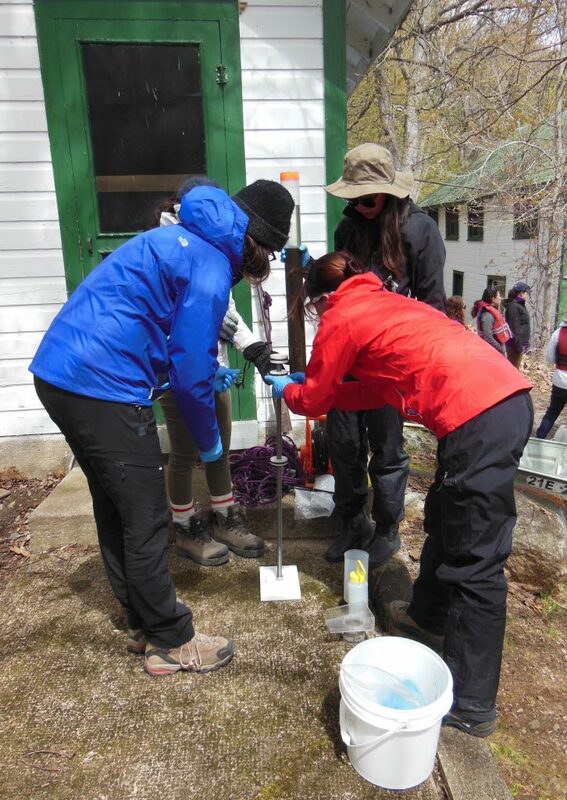 A few trainees also had the opportunity to participate in the collection of a freeze core, which involved deploying a wedge-shaped corer filled with a slurry of dry ice and alcohol to the bottom of the lake. Trainees prepare to deploy a percussion corer to the bottom of the lake. 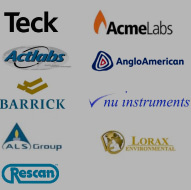 Percussion corers are designed to collect long, undisturbed cores of the mud-water interface in the lake water column. Trainees work together to mount the sediment core tube on top of the extruding disk, while managing to keep the extruding plug of the core tube in place. 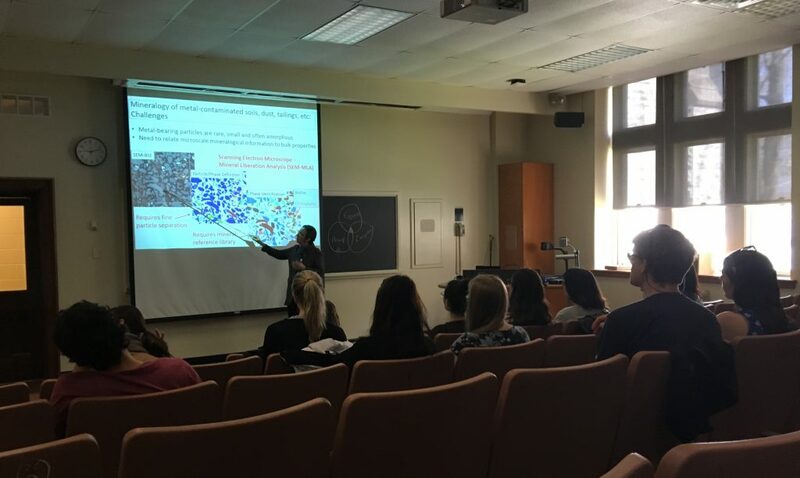 On Friday, Dr. Heather Jamieson of the Queen’s University Department of Geological Sciences and Geological Engineering gave a talk on the applications of automated mineralogy in assessing environmental risk. This was followed by a tour of the QFIR (Queen’s Facility of Isotope Research) Stable Isotope and Electron Microprobe Labs. 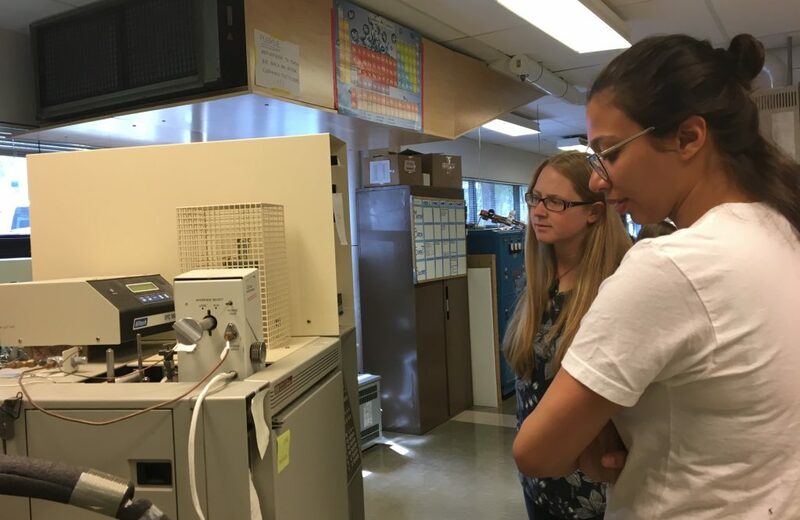 Trainees who use MC-ICP-MS in their research found the tours to be particularly interesting. After lunch, the group was given a tour of two labs in the Queen’s Department of Mining, the Microwave Extraction Lab and the Mineral Processing Lab, which included demonstrations of microwaving soap and crushing rocks. After the tours, trainees were treated to a free afternoon. Some used this time to work on their talks for the GAC-MAC conference, while others opted to explore the city and campus. Trainees listen to Dr. Jamieson’s presentation. Trainees Nichole and Evelyn admire the instruments at QFIR. The focus of Saturday was professional development skills. In the morning, trainees participated in an interview skills and strategies workshop presented by St. Lawrence College Professor Tom Brennan, where they learned how to write their own elevator speeches and practiced presenting them to the entire group. In the afternoon, MAGNET Professor Barbara Sherwood Lollar gave a useful and engaging talk about success strategies for writing scientific papers. For the last activity of the day, groups of trainees rotated between three different stations to discuss topics related to professional skills in academia and industry: the unconscious bias, project and time management skills, and selling and communicating scientific ideas. The stimulating discussions were facilitated by Dr. Sherwood Lollar, Dr. Bergquist, and MAGNET trainee Natalie Szponar. After the professional development activities were concluded, trainees and faculty made their way to Windmills restaurant in downtown Kingston for a wonderful wrap-up dinner. Trainees share their elevator speeches with each other during the professional development workshop. On the final day of the workshop, MAGNET Professors Dominique Weis and James Scoates held a brainstorming session for next year’s grand finale workshop in Hawaii. The trainees participated in a fun trivia game about Hawaii’s geography and geology, and then worked together as groups to come up with several exciting possibilities for workshop activities. After the official end of the workshop, many trainees remained in Kingston for the GAC-MAC conference, while others travelled back to their home cities to resume their studies and research. 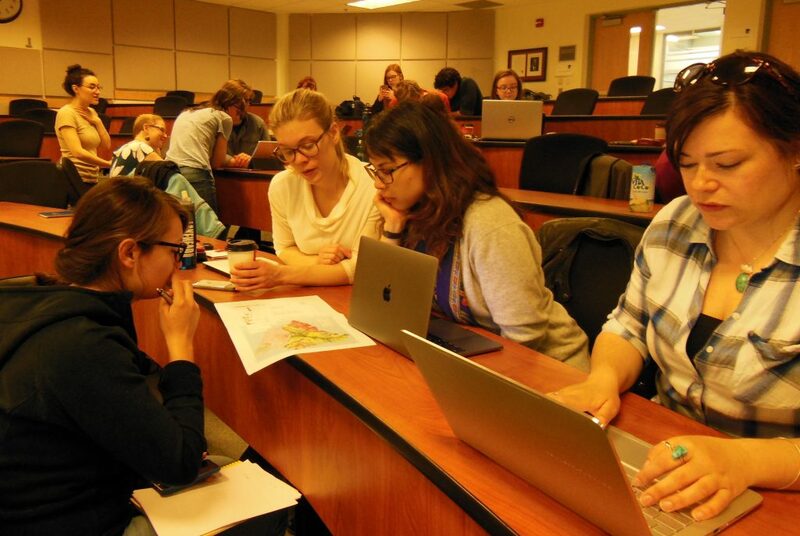 Groups of trainees work together to answer questions about Hawaii’s geography and geology. In summary, the 5th annual MAGNET workshop provided trainees with opportunities to learn new technical skills, generate collaborations, and form friendships. Like previous MAGNET workshops, and in accordance with the program’s philosophy, it was well-organized and very beneficial for the trainees and all participants. Many thanks to the trainees for their unwavering enthusiasm, and to the Toronto organizing committee for their hard work and planning that was integral to the success of the workshop!